Remarketing is a powerful way to reconnect with customers who have already visited your web site. It provides you with the opportunity to place highly targeted ads in front of a defined audience of users that have already visited your web site and know about your brand – as they browse through other web sites across the Net. 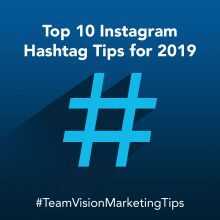 Here at Team Vision, we use our own remarketing ad campaigns to remind past visitors about our brand with fun and creative messaging. If you’ve landed here on our blog while searching for our main site, please visit the Team Vision main site. Otherwise, please continue on. Why Should I Use Remarketing Campaigns? There are many reasons why we highly recommend Google remarketing to our clients. First, unlike traditional display advertising, you are not casting a wide net and just hoping your ad gets in front of someone who is actually interested in your product or service. With remarketing, you are speaking directly to prospective customers who have already visited your web site and know about your company. Remarketing gives you the immediate opportunity to remind those prospects about your business and with a very targeted message. 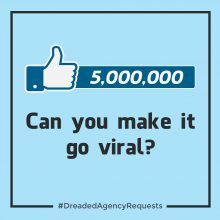 For example, if your goal is to sell a product or service, you can put a special offer in the ad that relates to specific pages those prospects went to on your web site. If you’re looking to improve brand awareness, you could craft a clever branding message and run the campaign over a period of time (flighting) targeting your key target audiences. How Do I Set Up a Remarketing Campaign? If you have experience using AdWords, Google Analytics, and some basic web site management skills, you may be able to set it up and manage the program yourself. However, we recommend working with a company that has experience creating and managing ongoing remarketing campaigns for multiple clients because they will know how to most effectively optimize your campaigns for the lowest CPC (cost-per-click) and greatest ROI based on their ongoing experience and learning. 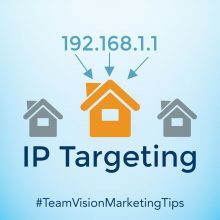 First, you will need to add a remarketing tag to all pages of your web site code (Note: You must achieve 100 Cookie ID’s on each remarketing list before your campaign will become active). Next, you will need to set up your campaign criteria such as targeting, bid type, ad schedule (day and times you want your ads to run), conversion tracking, max bid cost, etc. Finally, you will need to design your display ads and upload them to AdWords. There are quite a few standard display ad sizes. 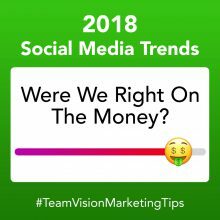 At Team Vision Marketing, we normally create 15 to 18 ad size variations for each campaign so that we achieve the most placements, and so our ads run in their original format and are not distorted or resized. Remarketing works by placing a cookie on the devices of those visitors who already visited your web site, and who also meet the predefined criteria you set up in AdWords. Their cookie ID is then added to your remarketing lists. Your targeting can be broad (i.e. 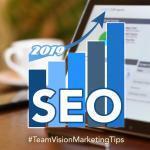 you can target anyone who visited your web site, or you can target visitors who visited a specific page on your web site but didn’t make a purchase or complete an action). You can set up multiple remarketing lists in your campaign, and you can create display ads that speak directly to the prospects on each list. Where Will My Remarketing Ads Show up? Your remarketing ads will appear on any web site that participates in the Google AdWords Display Network. The Google Display Network is the largest and most visited website group on the internet. In fact, the Display Network has the ability to reach 90% of Internet users worldwide. Through AdWords, you have the ability to target specific sites as well as exclude sites that may not be inline with your brand (i.e. sites with sexual content, violence, politic sites, etc.). You have the ability in AdWords Placements Report to see exactly which sites your ads appeared on. How Will I Know If My Remarketing Campaign Is Successful? The great thing about any digital online marketing campaign is that everything is 100% trackable. At a basic level, you will be able to monitor impressions, click-throughs, cost-per-clicks and cost per conversions on a daily basis. With conversion tracking code implemented, you will also be able to track sales revenues by campaign, by ad set and by specific ad. Another great benefit of remarketing is that you can easily modify campaign settings and ads on a regular basis until you achieve the goals you initially set out to accomplish. View samples of our online marketing, banner ads and remarketing ads in our extensive online portfolio at www.teamvision.com/portfolio. After years of advertiser feedback about the confusion regarding the extensive number of ad products and brands offered by Google, the company has decided to simplify with a product line rebrand. The new product names have already begun rolling out. The good news for ongoing advertisers who are very familiar with the existing products, services and systems, is that this is really just a series of product name changes and no migration or new product training is really required. Moving forward, Google’s ad products will be divided up into three major brands. Google Ads – formerly AdWords. This will serve as the interface where advertisers will buy on all Google platforms, including search, display ads, YouTube videos, Google Play apps advertisements and Google Maps. Google Marketing Platform – combines what was formerly DoubleClick and Google Analytics 360 which is the company’s analytics tool for marketers. Google Ad Manger – this platform combines Double Click Ad Exchange and DoubleClick for Publishers. These are both monetization tools for publishers. Google Ads offers the same great advertising tools that all advertisers really should be incorporating into their digital marketing mix. 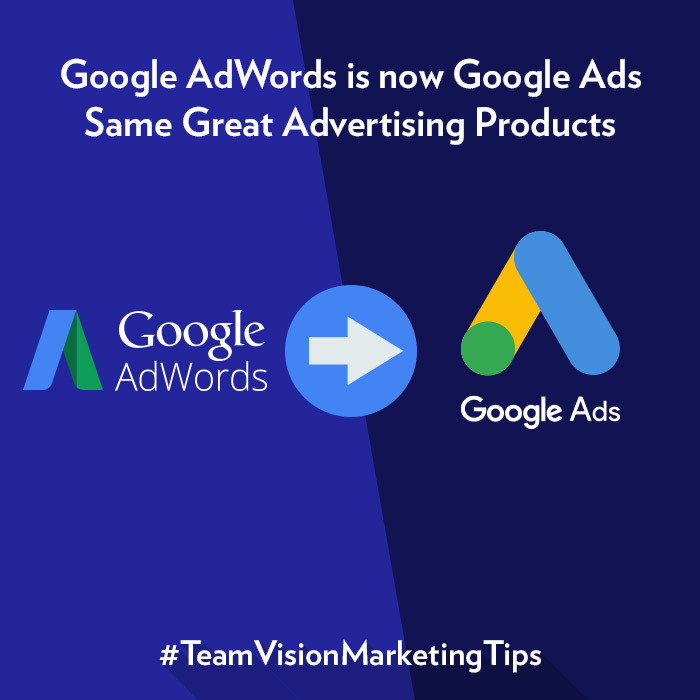 We’ve outlined just a few of the key Google Ads products we use here at Team Vision providing our clients with Google Ads Management Services. If you’d like to learn more, give us a call. A text ad is a form of marketing communication that advertisers can use to promote their product or service on the Google Network. Where text ads appear. These ads can appear on Google results pages and across the Google Network (you have the option to choose either or when setting up campaigns), which includes the Search Network, search partners, and the Display Network. The Google Display Network can help you reach people while they’re browsing favorite websites, watching a YouTube video, checking their Gmail message, or using their favorite apps. When ads show: While the Search Network can reach people when they’re already searching for specific good or services, the Google Display Network can help you capture customer attention earlier in the buying cycle. You can put your ads in front of people before they start searching for what you offer, which can be key for your overall advertising strategy. You can also remind people of what they’re interested in, as in the case of remarketing which we describe below. If you’d like to learn more about any of Google Ads, Google Pay-Per-Click, and other Google products and services, please reach out to us at info@teamvision.com, or call (808) 435-3924. We have extensive experience in managing all types of Google Ads, formerly Google AdWords, programs as well as analytics integrations with Google Analytics, phone tracking software and more. Whatever your desired KPI’s (Key Performance Indicators), we will set up automated tracking reports that will provide you with the information you need on a daily, weekly or monthly basis. 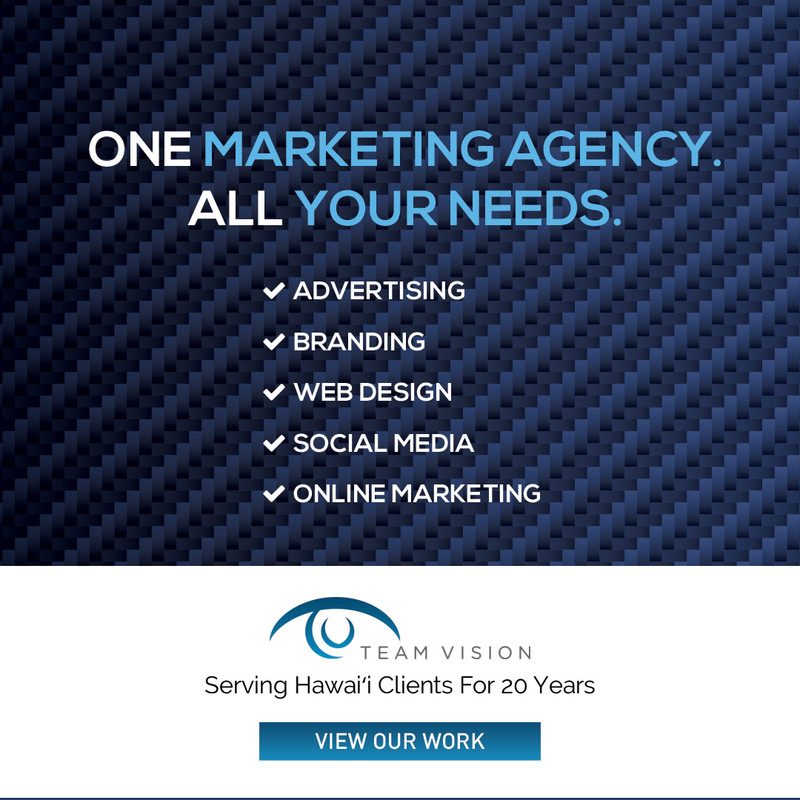 Team Vision Marketing is a Hawaii based full-service advertising and marketing agency that serves clients on Oahu, Maui, The Big Island and Kaua’i for over 20 years.